This program deals mainly with practical case studies and certain key subjects, with a pluridisciplinary focus. It prepares students and professionals for operations such as large acquisitions or market transactions, cross border mergers, complex financing, restructuring, LBOs, financial engineering, and industrial projects. These are interesting operations, offering difficulties that often lead to innovative solution seeking. It is particularly educational to study them and analyse the legal, financial or accounting issues raised. Thus, contracts, guarantees, financing and international trade litigation, among other basic subjects, can be studied from different angles. 10 courses of 10 hours each. Each course will be paired with a seminar of 10 hours. This module reviews the challenges and opportunities offered by the new technologies but also the loopholes and the necessary changes Artificial Intelligence May dictate. Principles governing environmental policy and international and European environmental law. Various forms of companies and concentrations between firms; rules governing mergers and acquisitions in an international environment. Resolving disputes through international arbitration (commercial, investment); the principles governing arbitration agreements, proceedings and awards. Rules governing European and international capital markets. 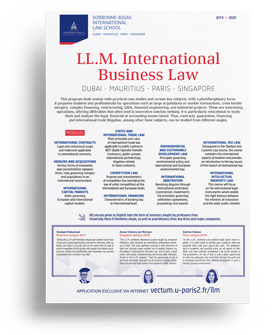 Legal and contractual scope and treatment applicable to international contracts. This course will focus on the international legal instruments which enable the right balance between the interests of innovators and the wider public interest. Subsequent to the Taxation and Customs Law course, this course considers the international aspects of taxation and provides an introduction to the key issues of this branch of international law. Main principles and rules of international trade law applicable to public contracts: BOT (Build-Operate-Transfer Contracts); public-private international partnerships; litigation related to State contracts. All courses are delivered in English take the form of seminars taught by professors from University Paris II Panthéon-Assas, as well as practitioners from law firms and major companies.